Below you will find a list of all the Wild Jack Casino bonuses - offered to new players. The right side offers a casino overview (click to scroll through the images). Wild Jack casino is a fully accredited Microgaming casino established in 1999. According to their code of ethics their main objectives are to be a brand that can be trusted, always being fair and transparent about payouts, and to maintain an environment that will keep players safe. On the fun side of things they are committed to bringing the best games to the table and to offer the most rewarding bonuses online. 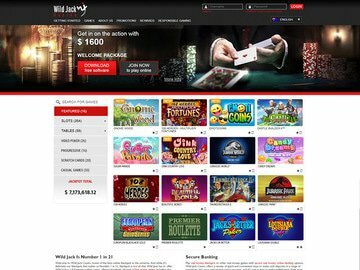 Wild Jack casino has been featured on all of the prominent gambling websites and magazines where they have established a name as being a premium Canadian online and mobile casino. Their presence is global and in Canada alone there are thousands of regular players betting from all major cities in Ontario, Quebec, Alberta and British Columbia, and even from smaller cities such as Prince Albert, Saskatchewan. Their generous free spins bonuses are a big attraction and many players have landed grand payouts while playing for free. Playing for the first time at the Android casino, or at the Wild Jack iPhone or iPad mobile casinos will instantly credit your account with a C$5 free no deposit bonus. Your mobile account is further supplemented by $500 in match bonuses on the first four deposits made in the first week. As a new online player you can take advantage of the same match bonus. Both online and mobile players receive loyalty incentives in the form of comp points that are worth real cash. Surprize bonuses can creep up on you when you least expect it where free cash appears in your account, or you could find a bonus code to launch massive random prizes such as cash-back or refunds. "The Stash" is a daily competition where players are entered automatically simply for playing where another 100 free credits are allocated randomly. VIP membership is by invitation only and as an elite player you will receive enhanced Wild Jack casino bonus offers, top support services, 10% match bonuses worth C$12,000 every year and entry into special events. 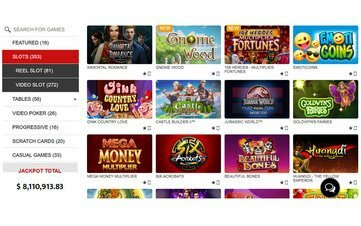 600 plus Microgaming powered games are part of the full-download package and new games are added to this impressive collection each month. Along with new game launches, promotional offers quite often accompany them with things such as free spins on slots. A vast selection of table poker games, a video poker collection that includes 100-hand games, multi-player and traditional blackjack, roulette, craps, baccarat and more can be played on either French, German, Spanish or English software platforms. The progressive jackpot network remains the largest online where millions in Canadian Dollar is up for grabs. The compact Canadian mobile casino is suitable for any WAP enabled device such as iPhone, iPad, Android and Blackberry. Mobile slots are a hit with favourites like The Dark Knight Rises progressive jackpot, Lara Croft Tomb Raider video slot, Immortal Romance video slot and the famous Mega Moolah progressive slot. Mobile blackjack, mobile roulette and mobile video poker games are redesigned to give you the full experience on your smaller device screen. Wild Jack also has a live-dealer option with games such as roulette and blackjack. Players in Canada can use Click2Pay, Vanilla - powered by VISA and MasterCard, InstaDebit or uKash, with the option to bank in CAD. 24/7 top support services are provided by means of live chat, email, and multiple toll-free numbers that includes one for Canada. The team can help you with banking, give you a special code to claim the latest Wild Jack casino bonus or simply give you some advice on how to play games. Wild Jack has the complete experience under one roof. With live games, mobile games, online games and instant play games, you can do it all in one place. Multi-lingual support and software also cater for French Canadians. The game variety is the biggest out there, which also counts for the Wild Jack mobile casino. The exclusive no deposit bonus of C$5 is a great starting-point for first-time mobile players.